“I believe that’s the infallible word of God, and that’s the way it’s going to be for his creation,” Shimkus said. Today Texas lawmakers picked up a bigger megaphone to get the attention of a bitterly divided, out-of-control State Board of Education. At a Capitol press conference, members of the Mexican American Legislative Caucus (MALC) announced that they are scheduling a public hearing for April 28 to examine how and why the state board has run off the tracks and what the Texas Legislature should do about it. 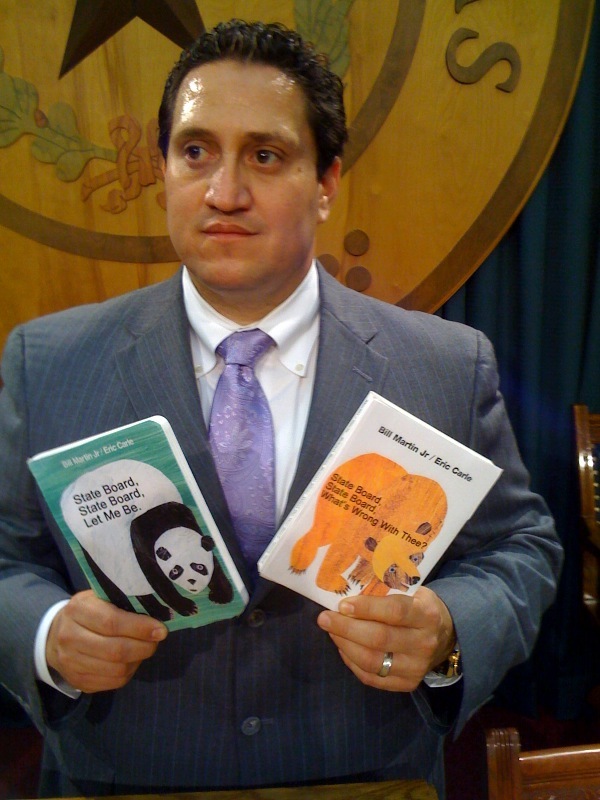 Calling the board a “national circus,” MALC Chairman Trey Martinez Fischer (photo), a Democratic state representative from San Antonio, said the hearing will focus on the board’s badly broken process for developing curriculum standards and adopting textbooks. The hearing will also look at the highly controversial decisions the board has made in the development of new social studies standards this year.